The KATA Process Improvement is a systematic method that facilitates standardized process improvement. Invented by the Japanese, it is a means via which the scientific method can be applied to a process in order to solve critical problems in a logical manner. The ultimate result is an improvement in process effectiveness, based on a chosen measurable parameter that can be continuously monitored. This methodology is an excellent tool to utilize when conducting root cause analysis on a problem. During the operation of any service or industrial business, it is common to encounter problems or challenges. Depending on the magnitude of the problem, the organization can stand to lose significant sums of money. Eliminating the challenge will enable progress in terms of process operations. It is quite beneficial to ensure that the organization’s staff are trained in this scientific way of thinking, which creates general process ownership. When persons feel that a process belongs to them, they will take the time to ensure that they are taking care of that process, and when problems arise, they will also take ownership and identify means via which they can solve them. The result is a smooth-running operation that is also continuously improving. A challenge presents itself in numerous ways. From the customer perspective, it may come in the form of a complaint. From a business perspective it can create a problem in terms of a monetary challenge that will need to be solved. The key is to ensure that the problem itself is clearly defined so that it can provide a suitable stepping stone to the next phase of the process. The pain point, is the point at which the rest of the process will flow. It is ideal to create a background for the challenge, so that appropriate perspectives can be formulated down the line. From a process perspective, it is important to gather data so that system current condition can be established. Identify how long the problem has persisted and how much it is affecting the organization. For example: As an organization, we are currently nine out of nine in terms of cost performance. We have been in this position for the past five quarters, and the regional headquarters is requesting that we improve our operations or else we risk being shut down as a facility. Once the current condition, and the relevant pain point has been identified, it will be important to identity a target solution. Based on the previous example of the struggling facility, what the management would have to do is identify which facility in the pool, that they would like to compete with. For example: As an organization, we are aiming to transition from the ninth position, to the fourth position in the company pool, within the next five years. Set smart targets that indicate that you are indeed committed to your plan. 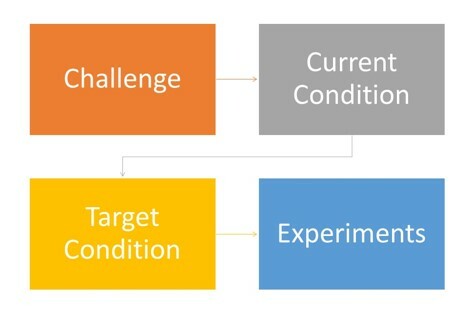 The bridge between a Current Condition and a Target Condition is a suitable action plan. No change will come unless it is induced into a system. What the experiments will do, in a structured fashion is to ensure that measurable progress is being made. An ideal approach is to identify industrial best practices, and work towards them. If none exist, this will be the ideal opportunity to create a standard that is suitable for your organization. Necessity is the mother of invention, so if you’re in a position to create new systems or processes that will enable you to reach your target, then this will be your opportunity to do so. Include the KATA Process Improvement strategy into your daily operations, and welcome smooth operations along your organizational journey.